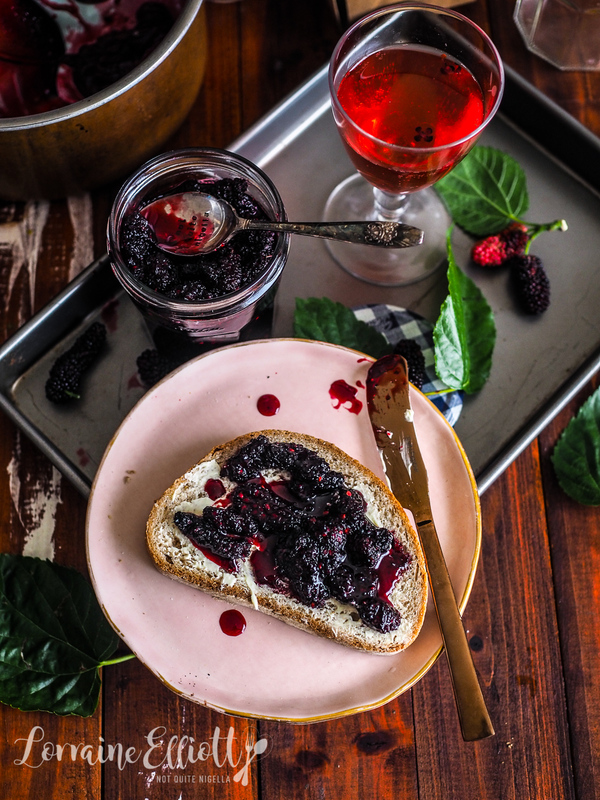 Have a glut of mulberries and not sure what to do with them? Try this mulberry gin and tonic jam! Made with pectin from lemon seeds and rind rather then pectin powder, this made a wonderful jam with plump whole fruit and the distinct flavour of gin & tonic! Chin chin! If day drinking (no judgement) and mimosas with breakfast are your thing, then dare I say this jam is just your sort of jam. 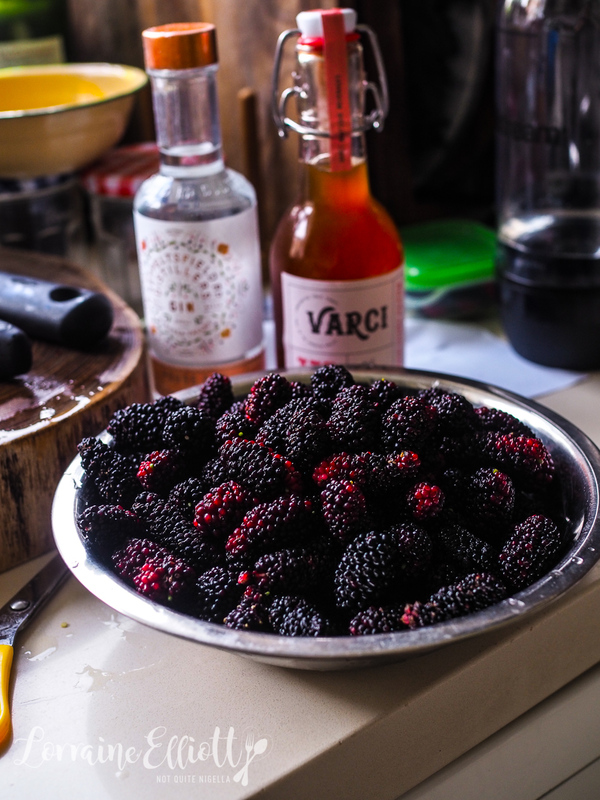 If you are blessed enough to have a mulberry tree, chances are your cup runneth over with mulberries and the best way to do something delicious with them is jam them because mulberries do cook down and even with a kilo of them you only get about 2x400ml/14oz. jars worth of jam. Unfortunately we don't have a mulberry tree (one disadvantage of apartment living) but we have found one that bears a lot of fruit and isn't too picked over on a side street in the Eastern suburbs. A few weeks after we first picked some berries, I pestered Mr NQN go back for more. He agreed as he loves mulberries and we made our way there one sunny afternoon. The tree was popular, people were already picking some and eating them straight off the tree. There was a man who owned the property that the mulberry tree was draped over and he watched Mr NQN reaching up to the sky to pluck the berries. "That's what they're for," he said he said nodding agreeably. He watched him for a few seconds before making a suggestion for him to climb the tree. Mr NQN wasn't sure so the man asked us to hand him our bag and quickly scaled the tree picking off the plump, ripe berries at the top. He climbed down and handed the bag over and we thanked him for his berry picking. Mr NQN then climbed the tree like a monkey scaling a tree for coconuts. "Don't fall!" I said pretty uselessly. I have never learned how to climb a tree and while it would have been better for me to do it as I am smaller, it was beyond my capability. Passersby watched him climb, some gave him smiles and other a thumbs up for my intrepid climber. And we got enough for a couple of jars of jam. A lot of lemons nowadays are seedless so avoid those if you're hoping to use the seeds for pectin. 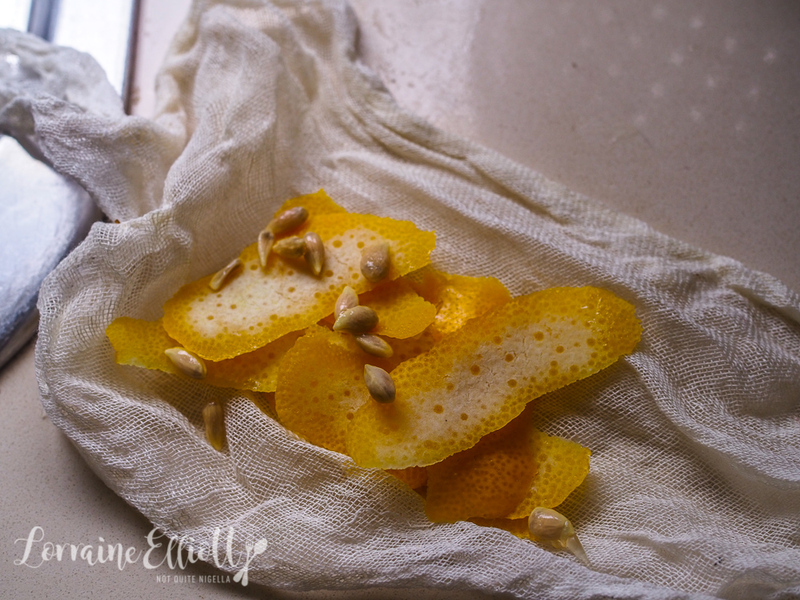 I was the lucky recipient of some fantastic lemons from my mother's friend's tree-these were super juicy with plenty of seeds so I used these to make the pectin and added a generous splash (ok more than a splash) of gin and tonic syrup! And I do believe this is what might motivate me to climb a tree! So tell me Dear Reader, do you know how to climb a tree? 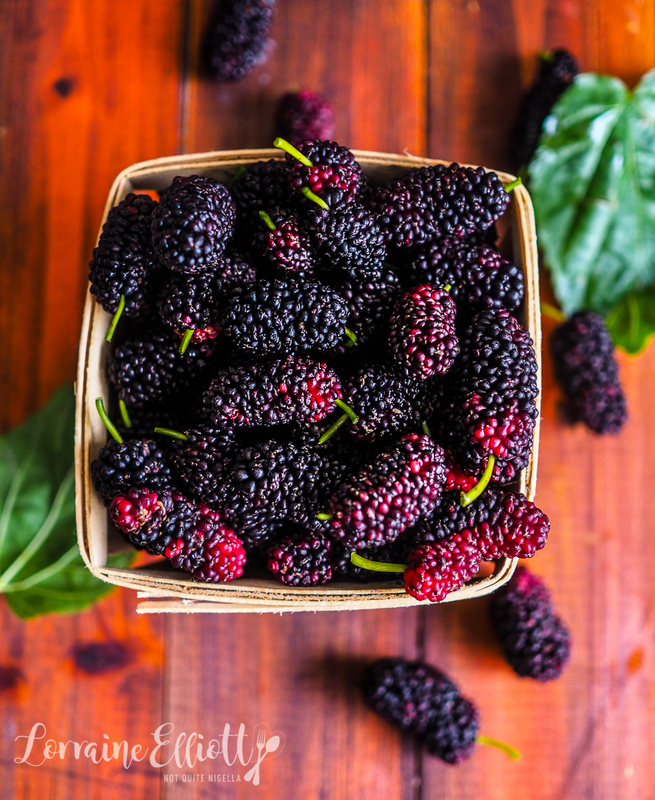 Have you ever picked mulberries? And do you like jams flavoured with alcohol? 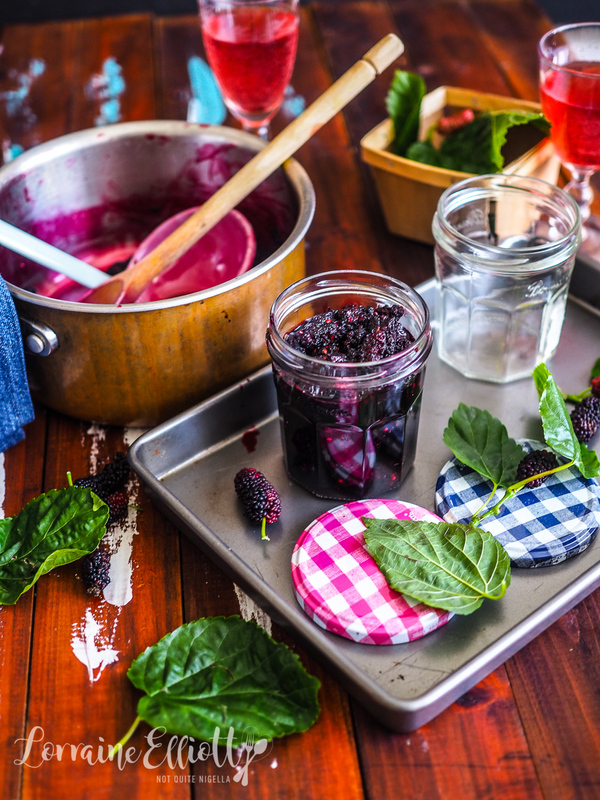 Step 1 - Wash and trim the mulberries (snip the green stem with scissors) and place the mulberries, sugar and lemon juice in a large, heavy bottomed pot on low to medium heat to start melting the sugar. Place the zest and seeds in a muslin pouch and once the mulberries start releasing their juices, add the pouch into the pot. Step 2 - Bring the berry mixture to a boil and simmer with the lid off pressing down gently on the pouch - this releases the pectin that thickens the jam (if you like a firm set jam, use jamsetta or a similar product). Place a freezer proof plate in the freezer and periodically test to see if the jam is ready by spooning a bit of liquid and then draw a line through it and if the line holds or wrinkles appear it is ready-it can take anything from 20-40 minutes depending on many factors. The sauce should be quite thick by then. Add the gin and tonic syrup and stir in - I like to keep the flavour so I don't cook it much more now. Step 3 - Sterilise jars by placing them in a 180C/350F oven for 10 minutes leaving them in the oven once they're done. When filling glass jars, make sure that the jar and filling are the same temperature or the glass will crack. Ladle the hot jam into the hot jars and screw tightly while wearing gloves. Place upside down on a baking tray and allow to cool. You should get a seal and can store them at room temperature. recipeHam Jam - The Tastiest Condiment For Your Christmas Ham! featureBacon Jam - Your Wildest Dreams Come True!